The chapter presents GINEXTRA®, a small-scale multipurpose modular and integrated biorefinery technology. The GINEXTRA® technology allows extracting the intact fibre for the production of high-quality yarns, fabrics and garments from the stems of the Spartium junceum shrub, a botanical species found in the genus Genista, using a proprietary enzyme-retting cocktail. After extraction of textile quality fibres, two side streams are generated: post-maceration liquid (PML) and solid waste (shives and tows). The side streams’ valorisation is fundamental to ensure the competitiveness and sustainability of the GINEXTRA® technology. Besides the production of high-quality yarns, fabrics and garments, lignin, hemicelluloses and cellulose pulp were extracted from the solid waste and purified. The production costs at the lab scale were calculated for these side streams (lignin 0.35 euro/kg; cellulose and hemicellulose 0.60 euro/kg). Moreover, the lab research results showed that it is possible to use the PML as a component of culture medium in the biosynthesis of bacterial nanocellulose (BNC). It was also possible to reduce the cost of biosynthesis by 25% by reducing or eliminating the amount of individual medium components and to obtain BNC with a comparable or even up to 29% higher yield than the standard culture medium (calculated costs at lab scale, BNC 22 euro/m2). The next round of research will concentrate on (1) combining in a single-step biorefinery plant both primitive fibre extraction and side stream processing and (2) reducing the ultimate energy and chemical requirements (by an estimate of 30%) for the full treatment of the lignocellulosic raw materials by combining mild thermochemical and thermomechanical technologies with enzyme applications. Infelise, L. is the coordinator of the whole chapter and author of the following Sects. 1, 2, 3, 4, 5, and 7. 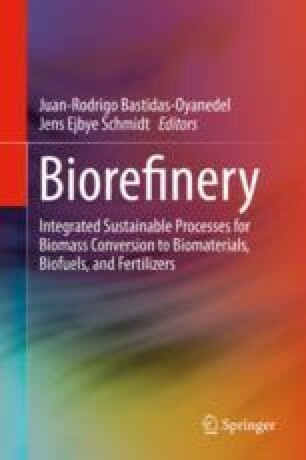 Kazimierczak J., Wietecha J., and Kopania E.—Institute of Biopolymers and Chemical Fibres—are the authors of Sect. 6.